Fifteen years ago, Rose Community Foundation helped launch ProComp, Denver Public Schools’ innovative performance-based teacher compensation system. Today, we remain committed to the program and are helping it continue to evolve. Given the clear link between excellent educators and student achievement, it’s easy to agree that great teachers should be compensated for their classroom successes. But historically, consensus has been challenging when it comes to exactly how to reward teachers for their performance. Rose Community Foundation played an early and central role in Denver Public Schools’ (DPS) innovative performance-based teacher compensation system, ProComp. 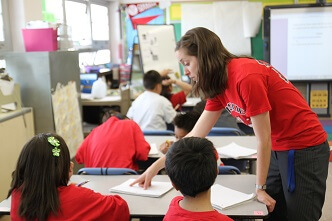 Today, as DPS and the Denver Classroom Teachers Association (DCTA) prepare for negotiating a new contract in the 2014-2015 school year, we remain committed to helping teachers and the district reach consensus on ways to reward teacher excellence. Earlier this year, we helped facilitate a design team to develop a vision for the next iteration of ProComp. This team is comprised of practicing teachers and DCTA members who are leading and shaping the work of this group in partnership with school district administrators. ProComp’s history dates back to 1999, when DPS and DCTA came together to build a pay-for-performance pilot. With our help, both organizations agreed to continue to work together to provide teacher incentives based on student achievement, continued professional development and for meeting the needs of the district or particular students. The result was ProComp, designed by a joint task force, and in 2004, voted into place by DCTA members and the DPS Board of Education. In 2005, Denver voters approved a tax increase, which raises $25 million annually to fund ProComp. ProComp was expanded in 2008 to increase incentives for student achievement and teachers serving in schools with high needs or hard-to-staff assignments. A 2011 study conducted by University of Colorado Denver and the University of Washington found that ProComp had a positive impact on DPS as a whole, showing that since 2006, DPS retained an average of 160 more teachers per year. We have remained committed to ProComp over the last 15 years and maintain a continued partnership with both DPS and DCTA. We are eager to continue supporting this pioneering program that’s an excellent example of our commitment to systemic change. What are the ProComp Incentives? The average ProComp incentive earned in the 2012 – 2013 school year was $6,000 – $7,000. Teachers have the opportunity to earn more than $17,000 in additional compensation in a given year. Learn more about ProComp at denverprocomp.dpsk12.org. Learn more about the Foundation’s work in Education at https://rcfdenver.org/what-we-do/focus-areas/education/.